Just because I’m an “adult” doesn’t mean I can’t let my inner-child out to play every once in a while. I’ve reached the point in my life where canned Chef Boyardee ravioli and SpaghettiO’s just aren’t common items found in my home. 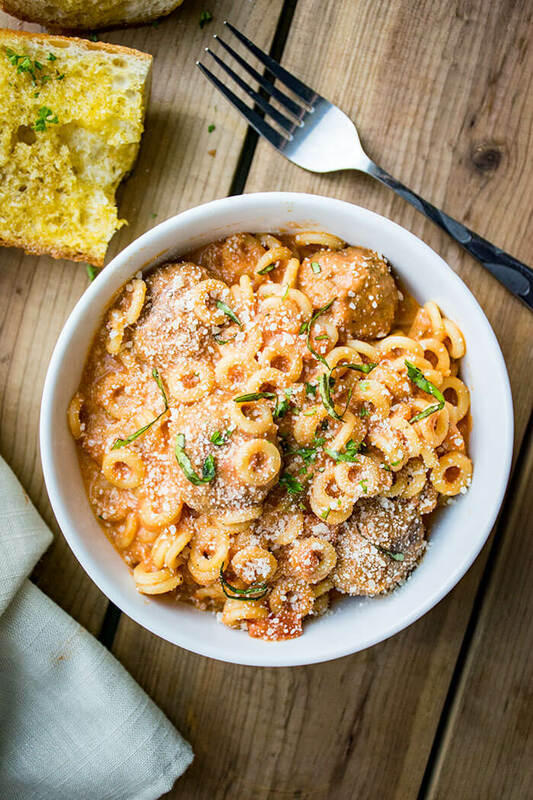 But the other day I came across Annelli pasta noodles – aka the “O’s” in SpaghettiO’s and I instantly had a craving. Plus, I had just received a Bialetti pasta pot to test out, so I knew what I had to do. 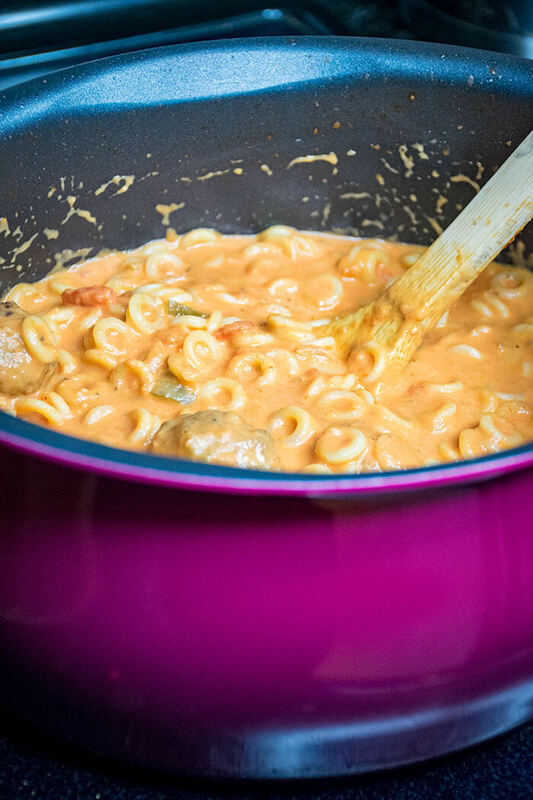 The Bialetti pasta pot has quickly become my go-to pot when it comes to cooking pasta – and sauces. 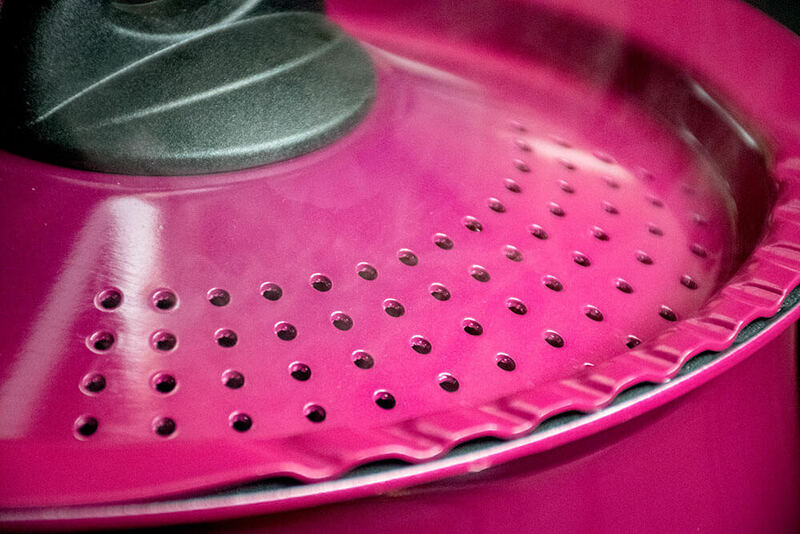 The oval shape prevents noodle breakage and has a non-stick bottom too! The lid locks on to make it easy to drain your pasta without the use of a strainer. But, I’ve found it serves a double purpose: the perfect spatter lid for making tomato sauce! 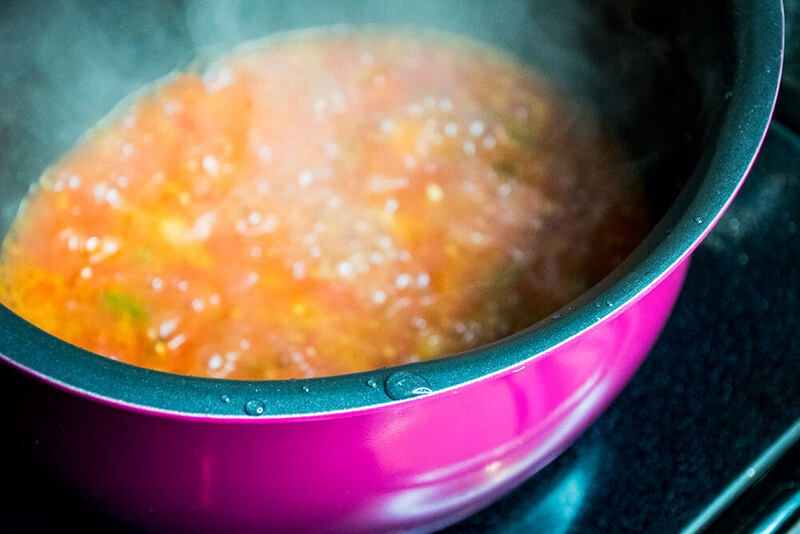 If there’s one thing that irks me about all of the other pots and lids I own, it’s that most lids don’t have any way to let out steam; and when you are making a tomato sauce from scratch, leaving a lid on can add additional water to the sauce making it separate once it’s cooled. 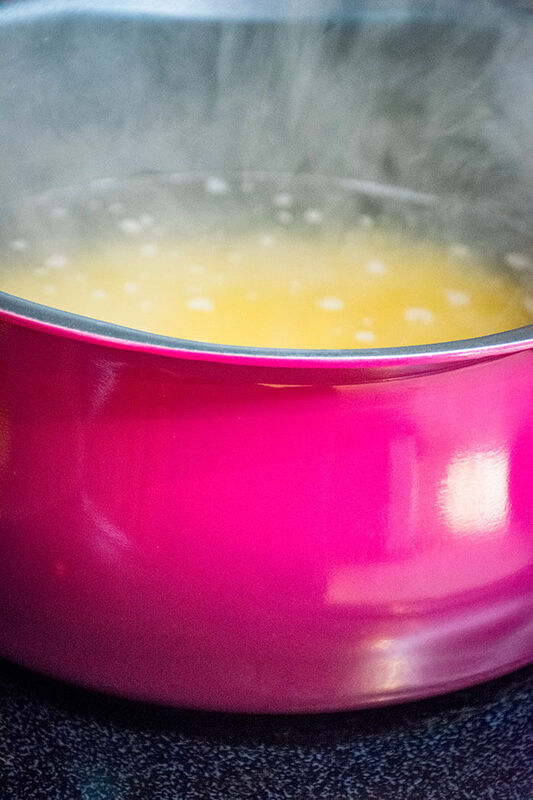 The Bialetti pasta pot lets out the steam while keeping all of the sauce inside – instead of all around my oven top as a normal pot would. With a normal pot, I’m either fighting steam or fighting spatter – and I much prefer the Bialetti pot for being able to handle the best of both worlds. My homemade vodka sauce consists of homegrown tomatoes and herbs, but using canned tomatoes will yield the same results. 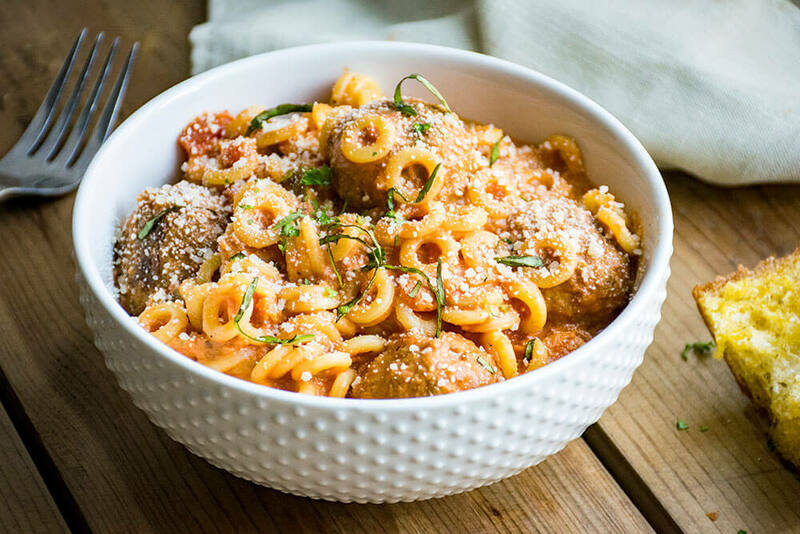 These SpaghettiO’s are made in a creamy vodka sauce and served with turkey meatballs – all things I would have balked at as a child. 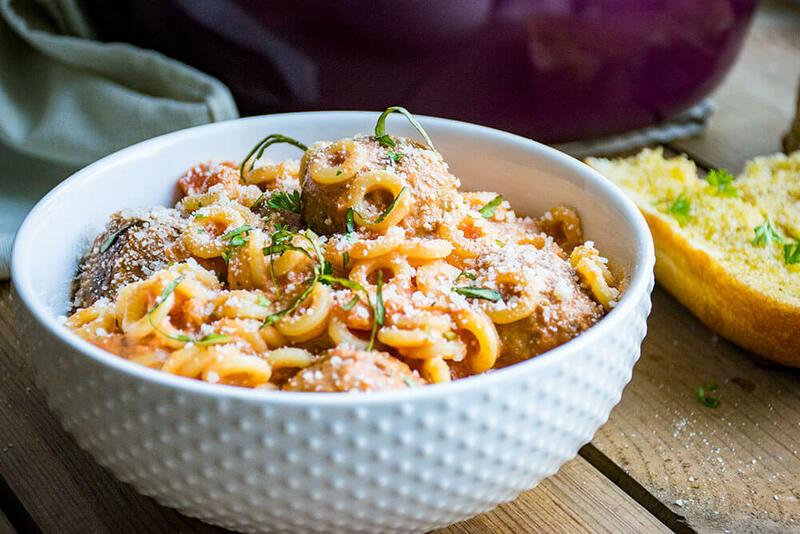 You can make your own turkey meatballs from scratch or you can buy them precooked from your grocery store – whichever you prefer! So now on the nights where I am feeling less-than-an-adult or just nights that I’m craving childhood memories, this adultier version of a kiddie classic hits all the right comfort-food buttons to make me feel like a kid again. 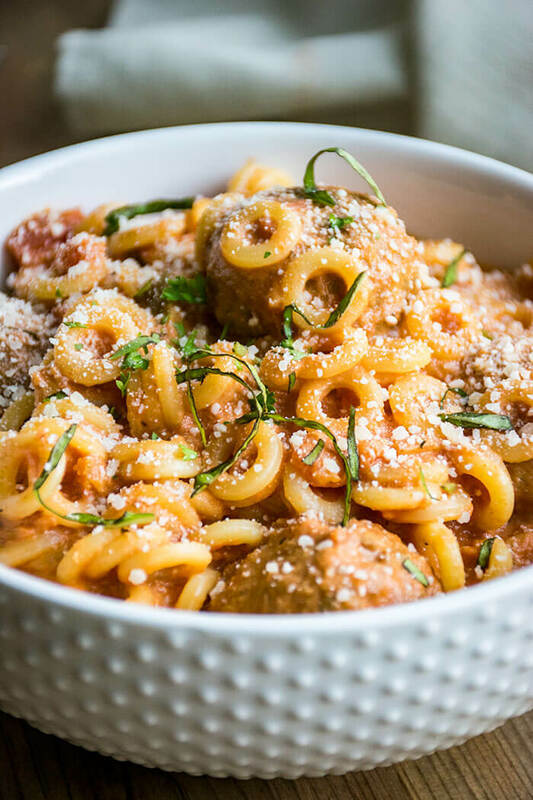 While the pasta boils, cook the turkey meatballs according to the instructions on the package or make homemade turkey meatballs the day before. Using the Bialetti pasta pot or similar stovetop pot, cook the Annelli pasta according to the package instructions. 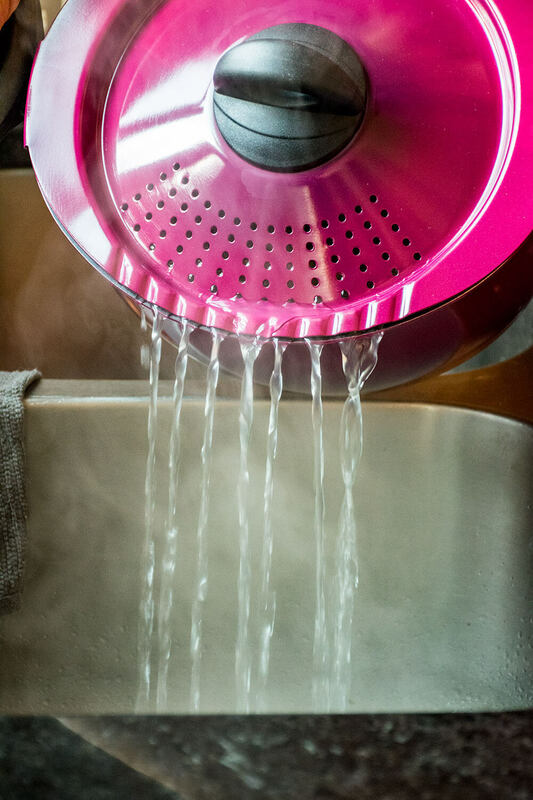 Reserve ½ cup of pasta water when straining. Set cooked pasta aside. Melt the butter over medium high heat until it is browned and frothy. Add the onions and saute for 2-3 minutes until tender. Then add the peppers and saute for another 2-3 minutes, until the onions are caramelizing and the peppers are softened. Add in the minced garlic and stir until fragrant, about 1 minute. Then add in the diced tomatoes. 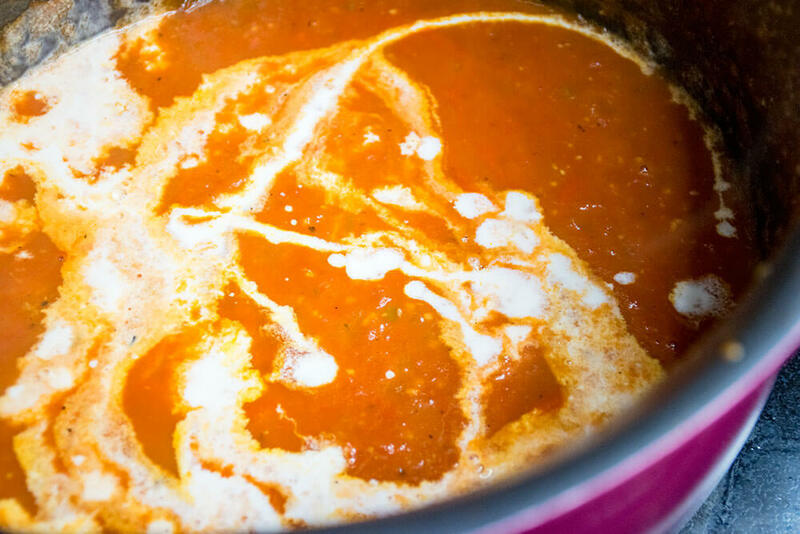 Simmer until most of the moisture from the tomatoes has evaporated, about 3-5 minutes. Pour in the vodka. Let simmer for another 2-3 minutes, until the alcohol has cooked off. Then pour in the tomato sauce and reserved pasta water and stir until it is well combined. Bring to a rolling simmer and cover with the lid. Simmer with the lid on for 10-15 minutes, stirring occasionally. 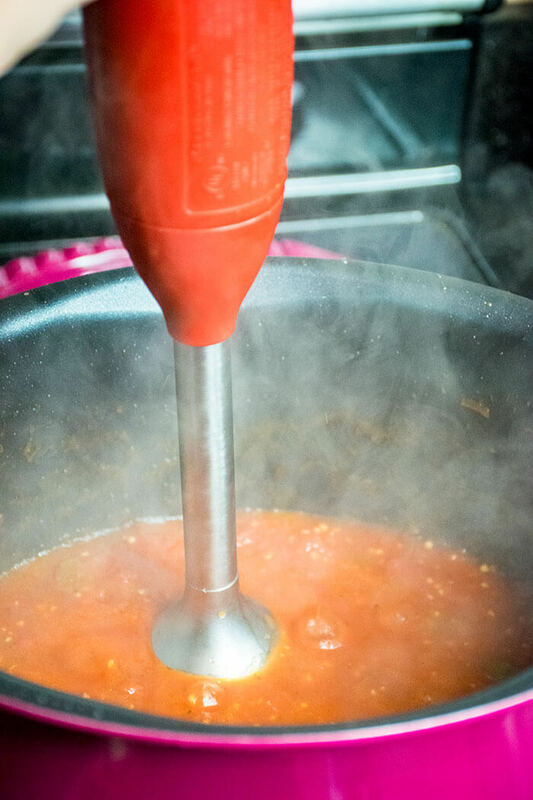 For a smoother pasta sauce, use a handheld immersion blender to blend the sauce until it is smooth. For a chunky sauce, do not blend the sauce. Pour in the heavy cream and turn the heat to medium low. Stir in the cooked noodles until covered then stir in the cooked turkey meatballs. Cook until the meatballs are warmed through. 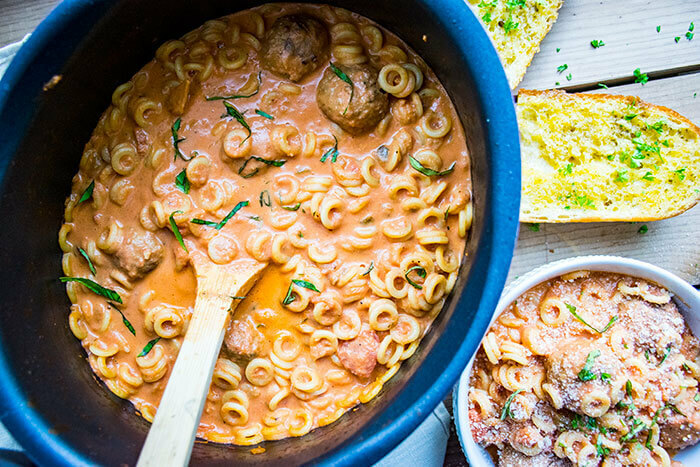 Serve with a chunk of garlic bread and enjoy!